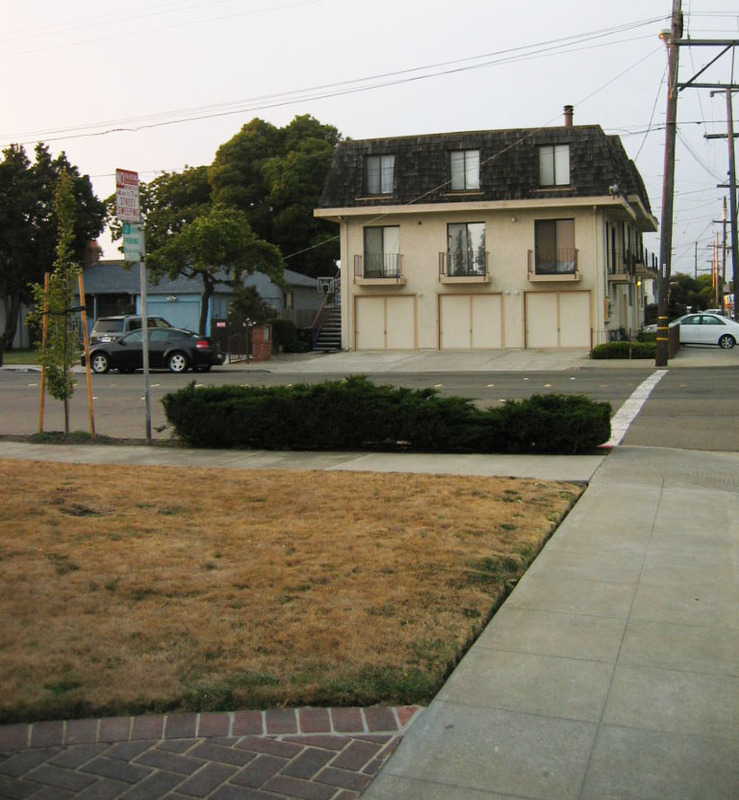 For a while now I’ve been meaning to post about converting lawns to low-water plants. We do it 2 or 3 times a year, and Anita and I have both taught workshops on the process. 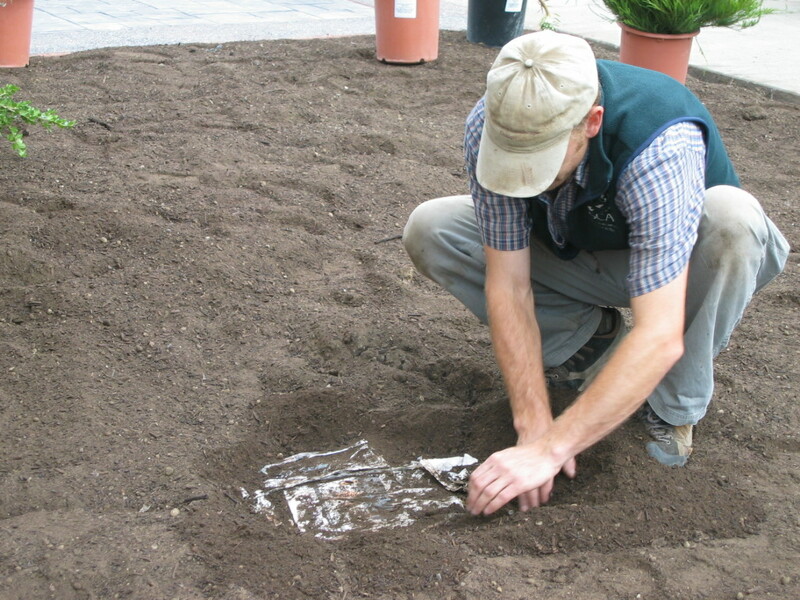 We convert the lawns with the use of sheet-mulch: a smothering layer of newspaper or cardboard covered by compost and mulch. It’s really easy and it works well, one of the few cases in life where the easiest way to do something is also the most effective. We first had the client stop watering the lawn for a month. 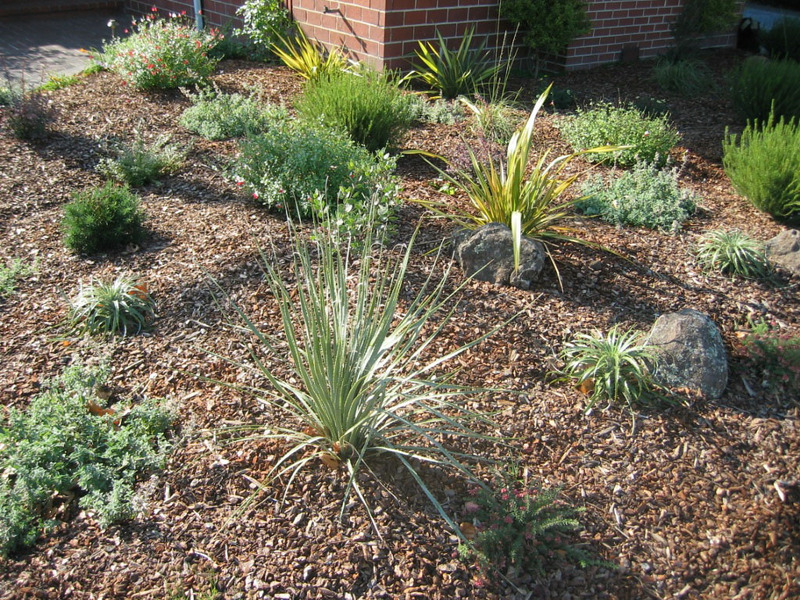 EBMUD has a rebate program that gives $.50 for every square foot of lawn taken out and replaced with low-water plants and drip irrigation. If you’re going get a rebate, make sure you get them out for the pre-inspection before you stop watering; they only give rebates for removal of green lawns. 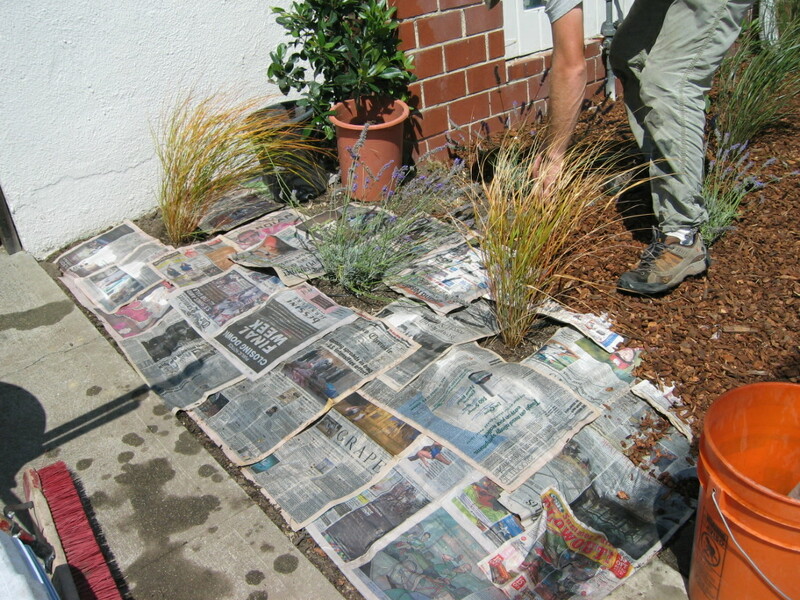 We covered the lawn with newspaper (cardboard also works) and a layer of compost or planting mix. We also cut away the sod at the edges next to the sidewalk and put those pieces of sod in a couple of piles covered with compost. Lawns tend to be flat and geometric, so we like to form a low mound or two for visual interest. The mound does not have be high — even 4 or 6 inches is enough — and it really helps banish the ghost of the flat lawn underneath. We put out the plants and planted them through the soil and newspaper. The neighbors always think we’re crazy when we start covering everything with newspaper, but the arrival of the plants starts to restore their confidence. Another way to do it is to put a layer of compost on the lawn, plant, put out the layer of newspaper, and then cover it with mulch. The newspaper is more likely to show if it’s on top of the compost, but you don’t have to deal with the newspaper while you are planting. We usually do the newspaper about 12 sheets thick and we try to make sure it overlaps by several inches. We soak the newspaper in a bucket of water before we lay it down so that it sticks together, like paper-mache for your yard. 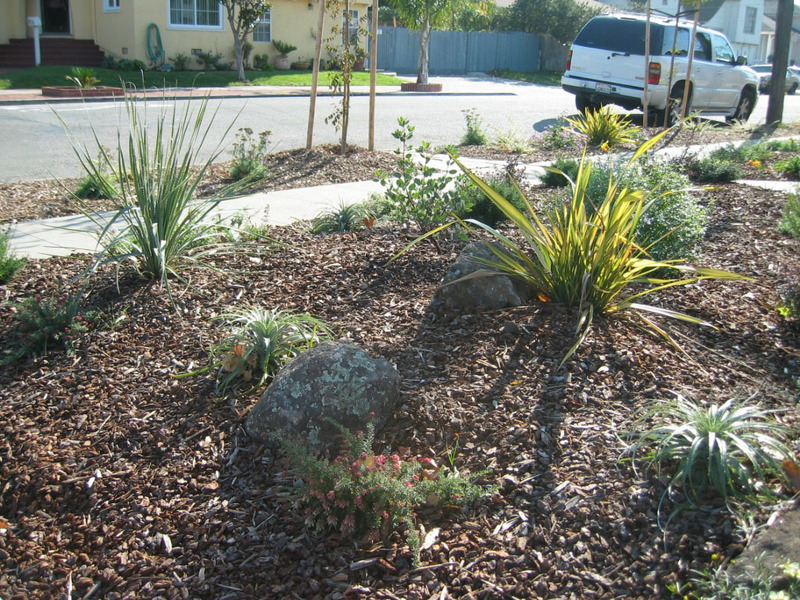 Compost or mulch needs to go on top of it as soon as possible to hold it down and keep it from blowing away. Thicker layers are better, but a lot of time we’re working close to a sidewalk where it’s not practical to make a thick layer. These two photos are from soon after planting. The next photo is from last year, when the planting was a year old. 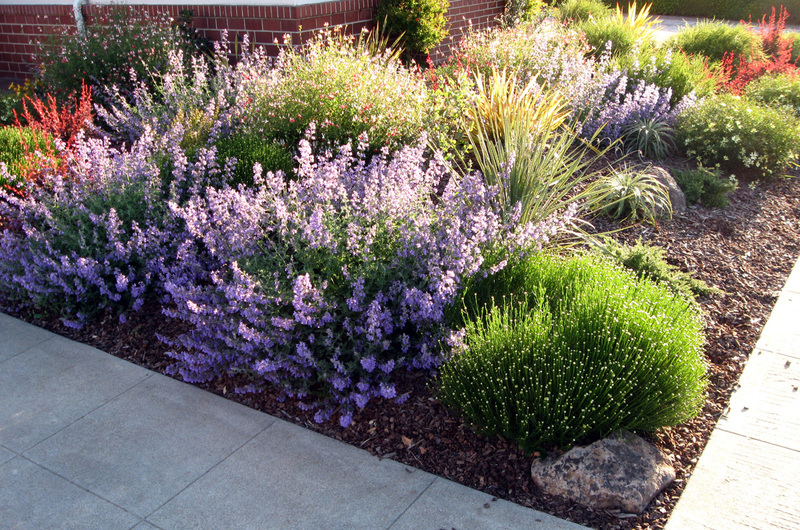 Between the compost, the decaying lawn, and the remnant fertilizers from the lawn, the plants usually grow really quickly. The Luma apiculata (Chilean Myrtle) planted as a 1 gallon is already more than 8 feet tall after only 2 years. StopWaste has a great step by step breakdown of the process and page with tips. Sheet-mulching is a little like cooking, everyone does it with their own slight variation, but StopWaste has a solid recipe. This entry was posted on Thursday, May 27th, 2010 at 11:20 pm and is filed under lawn to garden, private gardens. You can follow any responses to this entry through the RSS 2.0 feed. You can leave a response, or trackback from your own site. Great to hear this approach really works, even with bermuda grass. Lawns are disappearing fast on my street, and I was hesitant to endorse sheet mulching without having done it myself. We removed our lawn the old-fashioned, labor-intensive way. That includes flora and fauna. Excellent plant selection. The whole scene looks natural, a bright composition. 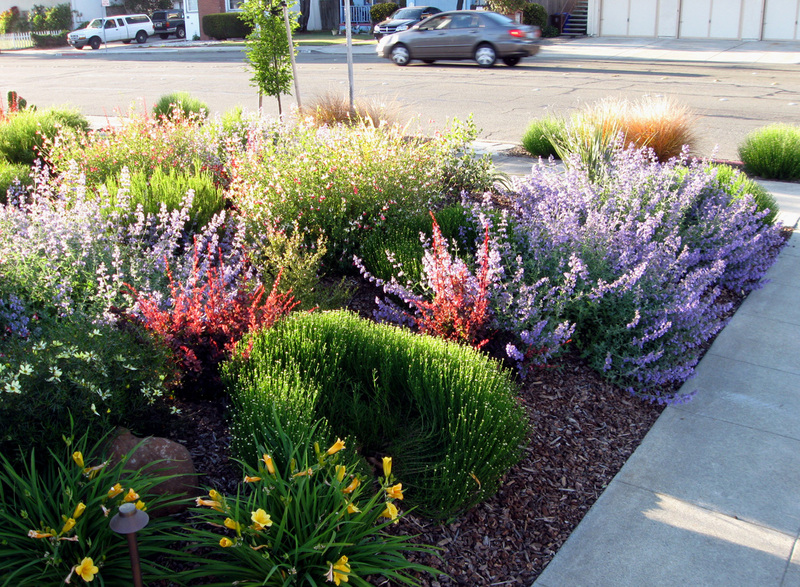 What a wonderful post to share with people who are considering lawn removal or just installing a drought tolerant landscape. Very lovely results! Very encouraging! It has definitely worked well for us for lawn grass. Bermuda grass, oxalis, and ivy all need some follow up to completely eradicate, but you can’t completely get rid of them by digging them out either. Thanks. One less space to mow and blow is reason enough to take out a lawn. The best lawn on the street is the one eliminated 🙂 I’m not sure which photo I liked best. 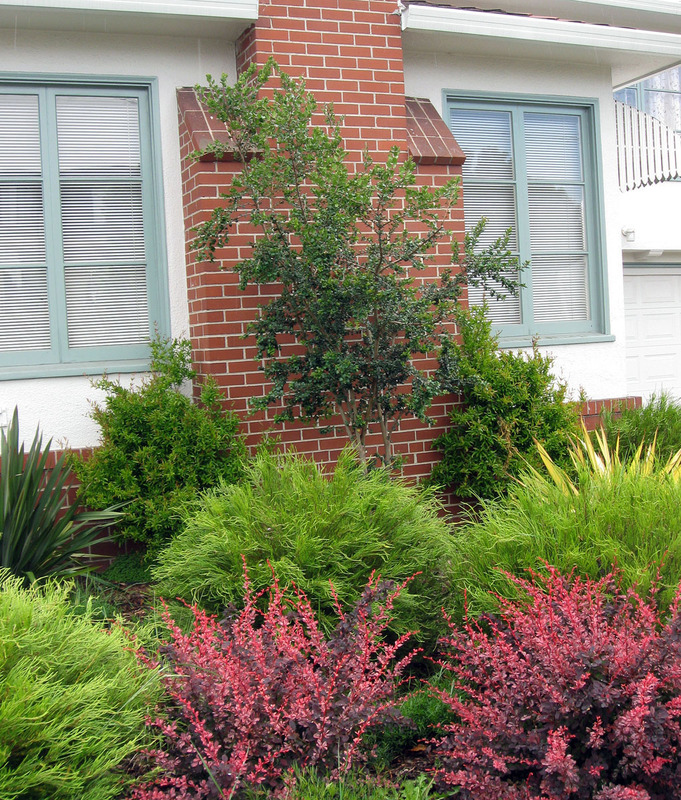 The one with the plants laid out showing the promise of what’s to come and the contrast with the rest of the street or the form and colors of the year old planting. Definitely a success story, and one that didn’t take that long to come into its own. This is so much more interesting than lawn. What will we use for these projects once newspapers go the way of the dodo bird? What a fun post. Isn’t it amazing how quickly the new plants fill in? 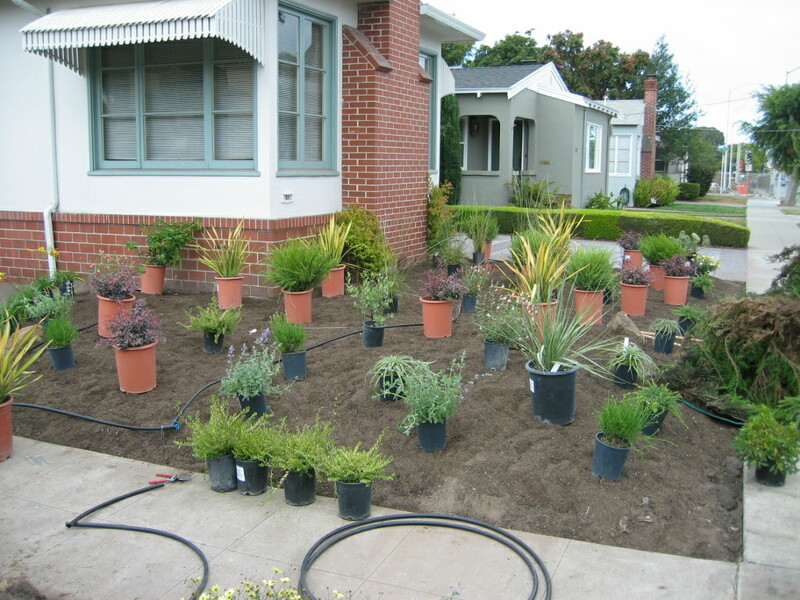 As for the rebates, a word of caution: Here in Santa Clara County, you only get the rebate if the assessor checking your garden sees a green lawn or other water guzzlers. So, don’t let the lawn die and apply before you start planting. And yes, they are quite strict about that. (No, I never applied. But I talked to someone else who didn’t get the money). I always like laying out the plants and envisioning what it will all look like. I’m trying to be better about photographing the whole process, but I get caught up in the work and forget to take photos. Good point. You can’t sheet mulch with a blog post. That’s a good point about the rebates. They have become stricter this year.